Meet Dylan. The Russians are coming! The British are coming, wait he is both! He is a Russian Blue/British short hair mix. He is playful, sweet and loves brushing. As you can see, he likes to be in the middle of the activity, or attention...more pets for him. Smart cat. He is a cutie, plush fur, which is like silk. Beautiful green eyes, a Russian kitty trait. 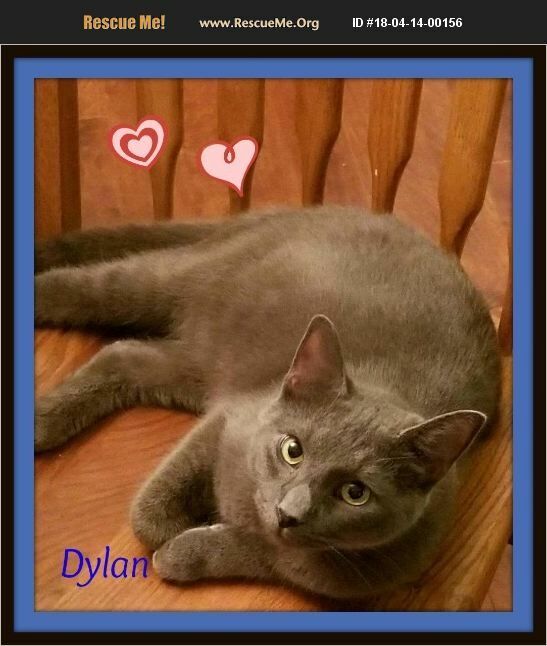 Dylan would prefer a quieter household to thrive well with a buddy. He likes to be by his foster Mom, and be loved on without a lot of commotion going on. Dylan will be the commotion. He gets his daily cat crazy time where he runs through a room chasing imaginary mice or toys, stopping on a dime to paw at something. He loves when his siblings and buddies join in and make it a Indy 500 run around the room. Dylan gets along well with other kitties and needs to be with another kitty. He adores the kitty tree the foster Mom has and watching nature outside. He likes little spongy balls to chase and the string on a pole too. He blooms being with his buddy, Tony. We offer a 2 week trial adoption to make sure he will be a great fit for your home. We have many other kitties list under Snow Camp Sanctuary, and many not yet listed as some are not vetted yet. Please send us an email as to what type of kitty your are looking for and chances are, we have your new best friend. Thank you for looking at our kitties, we appreciate you!